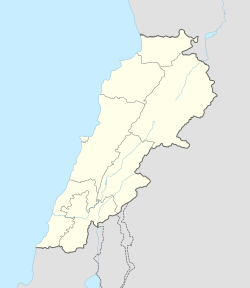 Baabda (Arabic: بعبدا‎) is the capital city of Baabda District as well as the capital of Mount Lebanon Governorate, western Lebanon. Baabda was the capital city of the autonomous Ottoman Mount Lebanon. Baabda is known for the Ottoman Castle (the serail) and it has many embassies (Italian, Japanese, Jordanian, Polish, Ukrainian, Romanian, Indonesian, Spanish ... ), the Ministry of Defense and many important organization and administrative centres in Lebanon. ^ Tourism in Baabda Region. Lebanon.com. Retrieved on 2008-01-30. This page was last edited on 20 September 2018, at 15:59 (UTC).